I’ve been hunting down some jewellery and would like to get my claws on these ones. 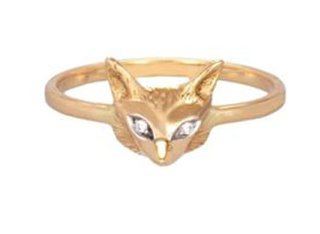 Zoe & Morgan‘s Who Loves Wins, AW09 collection is filled with spiders, lions and foxes for the brave-hearted. 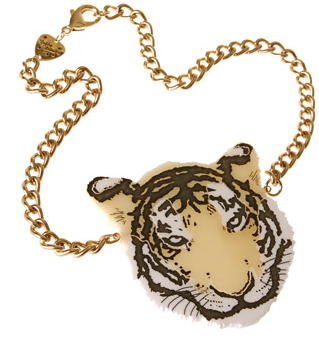 Following the success of Tatty Devine’s Tiger necklace, a limited edition for winter has been launched. The White Tiger is the wildcat for me. Who’s Next has just announced their Young Designers Winners list. The winners will have a chance to show in January, for free. On this list is Lena Klax. Her colourful polar bear necklaces come with detachable paw bracelets. I like the coral coloured one best. I am looking forward to seeing the pieces at the next Who’s Next. I love the Chinese characters or Kanji for Ping Pong for self-loving reasons and also the quirkiness of it. My surname Khew is the same character without the stroke at the bottom. The word Ping is only different because of the direction of the stroke. Ping to the left and Pong to the right. Without those strokes, you get the surname Khew. The last time I was home I took away with me a cute little sauce plate that is Chinese in origin. It had a little boy holding a ping pong paddle. This time round, I spotted my mum using a little bowl from the same set as the sauce plate. The bowl is decorated with four kids (two girls and two boys) playing a game of ping pong. It immediately reminded me of these cute little earrings I spotted in Tatty Devine recently. I was interested in looking at what other items were out there that were inspired by this very simple game. I found the following two items which I liked. This ping pong lamp is a nice environmentally-friendly creation and is made from used ping pong balls and is available from Studio Kleefstra. This ping pong table is a great design remix that doubles up as a work station. Inspired by the design on a pair of Paul Smith shoes designed by Hunn Wai . I especially love the lace that’s been used as a net on the table below. He has since designed another ping pong table that goes back to its roots and doubles up as a dining table. I looked up the history of ping pong to discovered that ping pong has its origins as an after-dinner amusement in Victorian England, mimicking the game of tennis. Every day objects like books, champagne corks, balls of string and cigar box lids were used to play ping pong (once known as wiff waff). I can’t really play ping pong but have always found this fairly amusing to watch. If you fancied watching a film about Ping Pong, seek this. Music lovers I recommend Michelle Plays Ping Pong by Daisy Daisy. I love, love Rachel Ortas‘ cute little illustrations of her outer space characters Ai Ai. (Funnily enough, in Mandarin Ai means love). The wonderful Clapham Books has a really nice window display of Okido magazine and Ai Ai monsters at the moment. The Ai Ai remind me a little of Yoshitomo Nara‘s work where the characters are seemingly cute and innocent but have a darker side to them. The key elements to making successful characters for children and adult. This is confirmed by previous exhibitions that were held in my favourite stores like Tatty Devine and Magma. I’ve long wanted to write on paper cutout and was prompted today to get the fingers dancing on the keyboard when I saw a beautiful (and simple) project by Lupin. I like the idea of revisiting children’s crafts and making it work in an adult setting. Paper cutout is a rather international folk art. It is also one that I am familiar with. And probably one everyone has come across, even in the form of the good old doily (oh how I love them). Chinese paper cutouts with auspicious designs are used to adorn doors and walls, especially during Chinese New Year and weddings. While Chinese paper cutout designs tend to focus on symmetry and symbols, Japanese paper cutout designs tend to be of nature. I randomly found a blog post about some very pretty paper cutout books that are available to buy from Amazon Japan. In Mexico, the art of papercutting is made using chisels on brightly coloured tissue paper. Papel picado is used, and looks like a more elaborate form of bunting for festivities with certain colours for certain festivities. I was very happy to stumble upon Casa Mexico one day on the way to Broadway Market. I was very inspired to have a party with lots of papel picado decorations and a giant pinata filled with goodies! Rob Ryan is the darling of the fashion industry (he has had many commissions from Vogue and recently designed a limited edition collection with Tatty Devine). This reputable paper cutout artist makes the sweetest most delicate paper cutout designs. Visit his shop on Columbia Road where you can buy his work. And to listen to while working away on projects, I think Premiere Classe’s Poupee Flash (heard on Metro Area Fabric mix 43) is perfect.